21st century living means that we are hosting more dinner parties than ever before, choosing to dine at home with friends and family over eating out. This modern lifestyle means that our dining tables have to step up to the challenge, providing a functional space that’s also stylish to create the perfect setting and atmosphere for sophisticated evenings over good food and drink. Stepping up to the challenge, Cattelan Italia are leaders in the industry when it comes to beautiful quality and highly functional dining tables. Using strikingly beautiful materials with modern design, the Cattelan Italia dining tables are made in Italy and are of eye catching quality. Simple yet sculptural, the Domino Table features a solid wood base and crystal clear glass top. The unique base can be made from solid Canaletto walnut, burned oak-stained ash wood, a mix of walnut and oak, or with an open pore painted finish. Alternatively, you can mix the finish on the base, to create a completely unique design to suit your style. Ideal for sleek and modern interiors, while simple, the table will become a statement piece. Although not attention seeking, drawing the eye away from the rest of the room, the Domino Table will still stand out, due to its stunning quality and quietly luxurious design. Sharp lines, a super thin top and chunky legs make the Eliot table from Cattelan Italia furniture unique. Oozing elegance, this table will create a real statement in your dining room. Ideal if you have a modern open plan space and want to draw the eye to the dining area, the Eliot table, particularly in an all black finish will add that all important depth and drama to your space, while also maintaining a humble and laidback edge. Choose from various finishes to create the perfect design for your scheme – no matter which material and combination you choose this table will have a high-end feel. Graphic with an industrial finish, the Gordon table features a rustic chunky wood top on more delicate metal legs. The beautiful contrast between the natural wood top and structural metal base makes for a truly unique piece. With an 8cm thick table top finished with irregular edges for an organic appeal, the Gordon table is ideal for modern interiors with industrial and natural elements. Try a contrasting wall finish to encourage this table to take centre stage, such as crisp white or a soft grey. Or to create a warm and inviting feel, try a deep and rich green colour scheme with complimentary wood and metal accessories. Likened to a piece of contemporary artwork, the Yoda table by Cattelan Italia will add a sophisticated elegance to your dining space, while maintaining modern design throughout. With a marble-like ceramic top and metal base, these quality materials perfectly combine to create a high-end piece that will add that instant wow factor. There’s little need to dress this table – the design speaks for itself, and overly dressing the Yoda table will only take away from it’s stunning finish. Choose from a variety of base and tabletop finishes to create the perfect design for your scheme. To up the luxe feel, try pulling the look together by introducing accessories in a metal finish. The ultimate sociable dining table is said to be a round one, as it encourages everyone around the table to be able to talk to one another and see each other clearly. The Ray table is perfect for sociable spaces, and brings a unique design twist with three legs to the base, instead of the traditional four. Ideal for adding interest with unique design, for those that prefer more balanced design, there is a four leg option available. 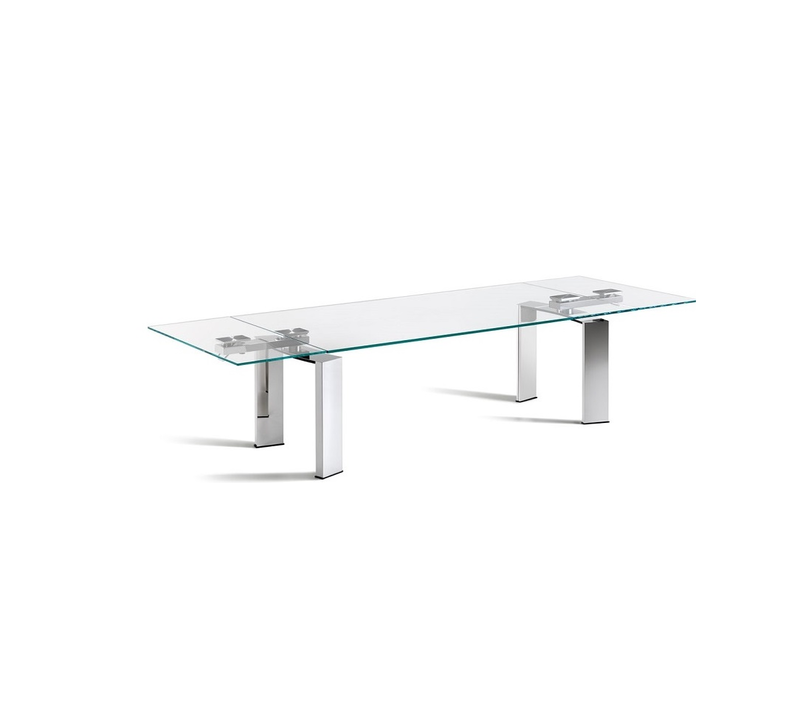 The glass top makes this table subtle yet chic, while the bold leg design makes for a real statement piece. Choose from a variety of bold colours to either match or contrast with your scheme, or stick to the more traditional but quality metal finishes. Focusing on function, quality and aesthetics, the Cattelan Italia dining tables are stunning pieces that will become well used focal point in the home. As the perfect way to update your dining space, the dining table is often the largest piece in the room, and therefore the focal point, making it well worth investing in quality and high-end design to create a stunning social space to enjoy with friends and family.